Nutritional therapy, or the practice of using vitamins, minerals, amino acids and fatty acids to maximize health, is gaining acceptance as a secondary and sometimes primary method of treating disease in people and animals. Nutritional therapy works slowly to help tissues heal and to maximize cellular metabolism. Because nutritional therapy is slow to produce noticeable change, it is often used with conventional drug therapy, surgery or radiation to combat disease. Vitamin C in high doses can help in the treatment of allergies, atherosclerosis, periodontal disease and osteoarthritis to name a few conditions. Vitamin E can act as an anti-oxidant to help prevent heart disease, skin diseases and cataracts. Vitamin A stabilizes skin cell membranes and aids in several skin diseases. (Note that fat-soluble vitamins can be stored in the body and can build up to exert toxic effects in high doses. Fat-soluble vitamins such as Vitamin A should be used at daily recommended doses or under the supervision of a veterinarian.) B vitamins have a broad range of effects and aid in the treatment of infections, allergies and stress. They are very important to a healthy immune system. Adequate essential and trace minerals are necessary at every metabolic level and aid in healthy skin and coat, appetite and activity. Due to the probable wide range of metabolic need and ability to ingest and metabolize vitamins and minerals that the various dog breeds experience, you may want to consider supplementing your pet with a high-quality vitamin/mineral supplement daily. Amino acids are the basic building blocks of protein. Most of us got that in high school biology. But many people are unaware that all the chemical messengers in the body (hormones) are proteins as well. The obvious effects of essential amino acid (protein) deficiency are weakness and muscle wasting. But some of the so-called non-essential amino acids can be important players in health and healing as well. Glutamine is a key source of energy for the cells that line the gastrointestinal tract. Any disease process or stress that injures the GI tract may benefit from glutamine supplementation. Such conditions might include parvo virus, inflammatory bowel disease, pancreatitis and recovery from GI surgery. L-Carnitine helps cells throughout the body make energy. Supplementation is recommended in conditions of heart muscle disease. Taurine is an essential nutrient in the cat’s diet. Cats, both large and small, are unable to manufacture taurine within their bodies like the rest of us, and so must eat it in their diets. Taurine-deficient cats are susceptible to heart disease and degeneration of the retina of the eye, leading to blindness. Dimethylglycine (DMG) enhances oxygen use by cells, improving muscle activity. 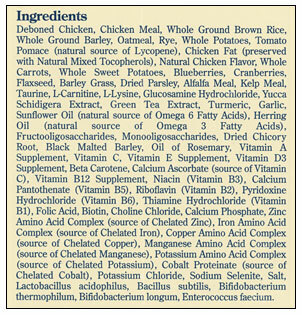 It has been used for years as a supplement for racing horses and greyhounds. It enhances the activity of the immune system and is considered useful in the treatment of conditions such as asthma, allergy and inflammation. Essential fatty acids, primarily omega-6 and omega-3, are used in the treatment of skin conditions in humans and animals. Omega-3 fatty acids are found in fish oils. Omega-6 fatty acids are in evening primrose oil, borage oil and some others. These fatty acids slow or stop the creation and activation of inflammation and so are useful in allergy, arthritis and perhaps many conditions where inflammation causes cell damage. PCA or proanthocyanidins, are plant products that prevent or slow the degradation of fats by oxygen (lipid peroxidation). PCAs have been isolated from grape seeds and pine bark.